Southport-Oak Island Area Chamber of Commerce Ribbon Cutting Ceremony for Martha Warner, Independent Sales Director for Mary Kay Cosmetics was held during an Open House on January 24th. As a Mary Kay Cosmetics representative, Ms. Warner specializing in skin care and color cosmetics available for one-on-one consultations, parties and events as well as makeup application and skin care advice. In December, Lisa Fosbury the owner of the Captain Newton’s Inn welcomed the community and members of the Southport-Oak Island Area Chamber of Commerce for the official Ribbon Cutting Ceremony for the Inn. Nestled in the heart of Southport, the Captain Newton’s Inn offers gracious hospitality in historic well-appointed rooms. It is also the only bed and breakfast in Southport where guests may enjoy relaxing by a pool. We shopped till we watched the sunset drop. What a fantastic start to our Cash Mob last evening. Thank you to our mobsters for participating, it was a pleasure meeting each of you. Not only did we support our local businesses -The Ricky Evans Gallery and Fishy Fishy Cafe', we met new people and had great conversations. On top of all that, we saved money because The Ricky Evans Gallery offered a few specials that were only good during the Cash Mob. Our next Mob will be on February 9th at 4pm. Meet at the corner of Davis & Moore Streets (Between Moore Street Market & NC Maritime Museum @ Southport. Members of the Chamber gathered at Carolinas Connect Realty for the first Coffee with the Girls event of 2017. Melissa Thomas, Melissa the Coach was the presenter and spoke about how a documentary on minimalism gave her a focus to purge the clutter in 2017. Coffee with the Girls, is an event of the Southport-Oak Island Area Chamber of Commerce and provides a network of women and men who meet monthly to discuss not only women related business issues but share helpful information and tips. The next Coffee with the Girls is scheduled for Tuesday, February 21st at 8am in Side Street Bakery. 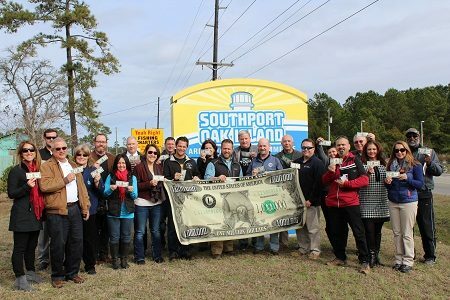 Southport-Oak Island Area Chamber of Commerce Ribbon Cutting Ceremony was held to celebrate the opening the new location of Coastal Shutters & Blinds, 4961 Long Beach Road, Unit 4 in the Live Oak Shopping Center, Southport. Coastal Shutters & Blinds has been the area’s quality source of plantation shutters, blinds, shades, awnings and Bahama shutters for over 12 years. New location. Same great quality and service. Chamber Networking Group Nets Members $518,481.16 in Sales! Boiling Spring Lakes, North Carolina - On Sunday, December 18, 2016, the board of directors and staff of Samara’s Village invited the community to join them to celebrate the organization’s one-year anniversary with a Ribbon Cutting Ceremony. This event marked the grand opening of the nonprofit’s first Counseling and Education Center in Brunswick County. The ceremony took place at 1450 Fifty Lakes Drive, Unit F in Boiling Spring Lakes, on the corner of River Road and Fifty Lakes Drive.